Winner of multiple film festival awards for Best Film and Best Actor, Simple Things remains a hard film to recommend. It relies on excellent performances by its two leads to maintain the audience’s interest in spite of being a true example of slow-burning drama. Sergei Puskepalis is Sergei Maslov, anaesthetist at a Russian hospital who is underpaid and relies on extorting his patients with threats of post-operative pain and nausea just to get by. His family shares an apartment with other Georgian immigrants and his young daughter has run off with a dock worker. When he is offered the opportunity of making extra money by treating a dying former film star’s pain, he develops an unusual bond with Zhuravlyov (Leonid Bronevoy) that will challenge the lifestyle he has allowed himself to get used to bearing. Maslov is onscreen for almost every one of the 110 minute running time, and is initially a bit hard to warm up to – he is quiet and beaten down, and Puskepalis allows him very little charm. Gradually, however, Maslov is allowed a little more warmth in a finely tuned performance by the former stage director in his first screen role. It is after the entrance of Leonid Bronevoy as Zhuravlyov, however, that the film gains momentum. 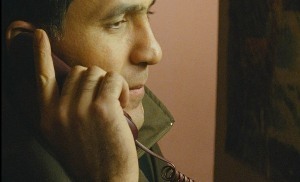 Much of the strength of the film lies in the relationship between the two men and their reactions to the needs of the other. Simple Things is shot to emphasise the drab interiors and bleak cityscape that the film suggests is the legacy of the Communist era. Washed out shots through yellow filters add to the atmosphere of depression and poverty of the setting. These techniques are effective, although the reliance on handheld camerawork for the street scenes is its usual distraction. The film moves very slowly, allowing the audience to develop a sense of these men and their lives without ever rushing. Writer/director Aleksei Popogrebsky utilises supporting cast only to focus the attention on another aspect of the leading turns, and as such they are adequate without ever capturing the imagination. The gradually building drama is effective, however for many the pace of the film will be too slow for real enjoyment. While the performance of the two leads and the evocative cinematography are excellent, it is perhaps the film’s pace that will make Simple Things a more difficult experience than it could have been. It can be recommended for those wishing an insight into post-Communist Russian society, or just a quiet, measured film experience that provokes contemplation.